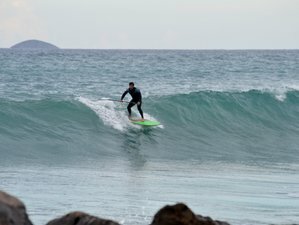 Surf in Crete invites you to a three-day SUP camp on beautiful Crete Island, in Greece. New SUP boards for all sizes and levels, carbon - fiberglass paddle and leash, wetsuit and lycra shirts, along with SUP theory lessons, SUP performance coaching, and SUP guiding with professional instructors are what you can expect during your stay. You will be accommodated at Light Filled Apartments and Studios. The apartments are equipped with private bathrooms, balcony, kitchen, and free Wi-Fi. Options for one, two, four, and six persons are available. There is a beach bar and snack bar for your day needs and a kitchen and barbeque area in your apartment's open area for your night needs.